You've spent the time to get your act together, and now it's time to let people hear the results. By buying this product you'll earn up to 1095 Rewards points. You've spent the time to get your act together, and now it's time to let people hear the results. 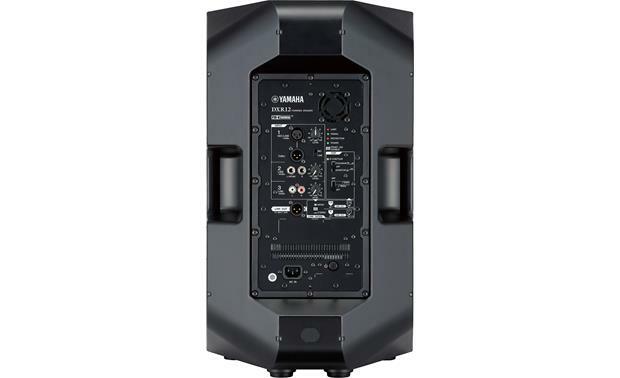 For them to be able to hear you, you need a small PA system…nothing world-shattering, just enough to be heard in a coffeehouse or other small venue. But you also want your system to be expandable as your options grow. So we've assembled a small, powerful, lightweight system to help you get your sound out there without breaking the bank. 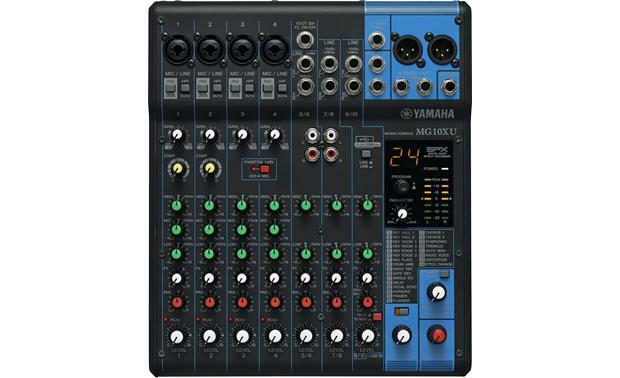 The mixer is the center of operations, where your signal goes in and sound for the speakers comes out. 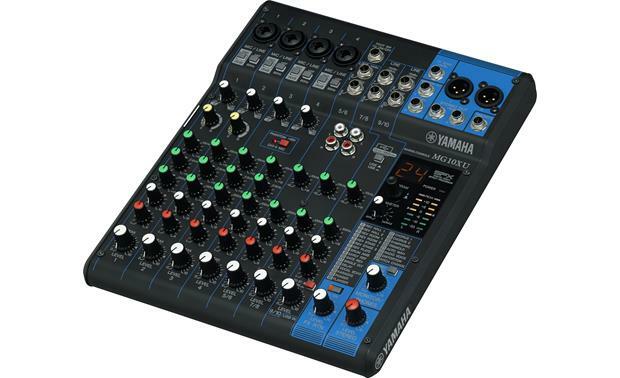 Yamaha's rugged, little MG10XU mixer gives you four XLR microphone inputs that double as line inputs, plus three sets of stereo 1/4" line inputs and two sets of RCA inputs, so it'll cover anything from a solo performer to a small group. Built-in effects and compression make it easy to get a good sound at the gig. 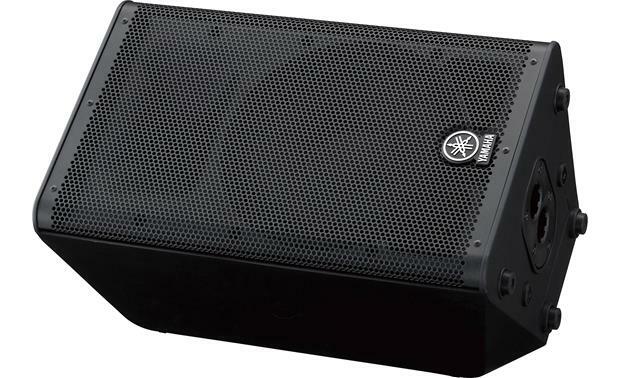 Powered speakers simplify PA setup because they eliminate the need for a separate amplifier and a lot of cabling. 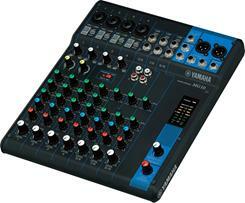 Just plug the Yamaha mixer into Yamaha's DXR12 speaker, adjust the speaker and mixer levels, and you're ready to go! 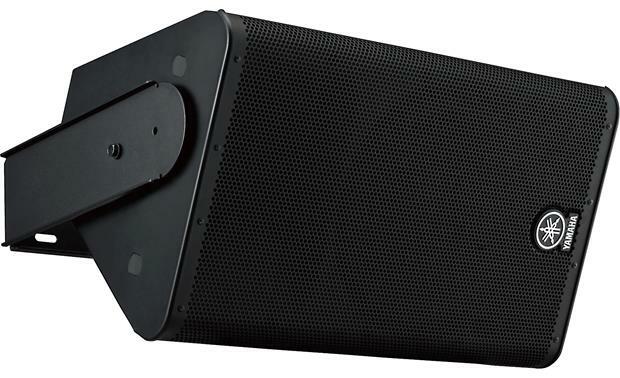 The DXR12 speaker gives you plenty of power for a small space and its tough ABS enclosure will stand up to the bumps and thumps of setup and takedown. For your singer (or potentially for acoustic instruments) to be heard, Shure's SM58 dynamic microphone is the worldwide standard for a reasonably-priced, good-sounding, and rugged microphone that'll get you through any situation. 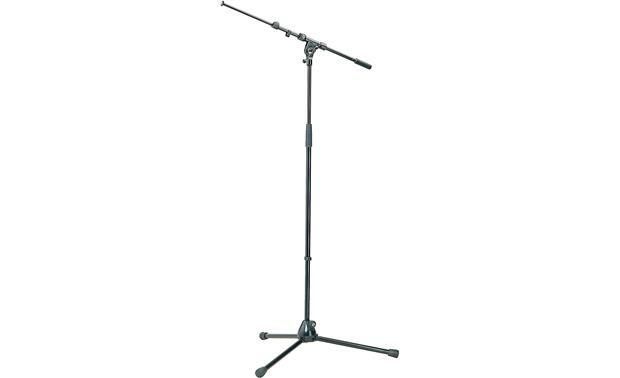 It includes an adjustable microphone holder that fits standard microphone stands. 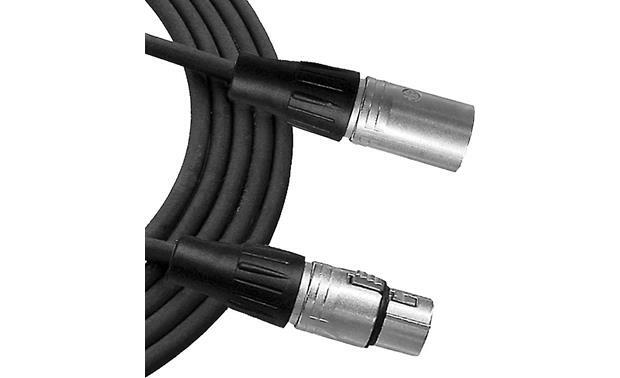 Cables provide a signal path from the mic to the speaker. 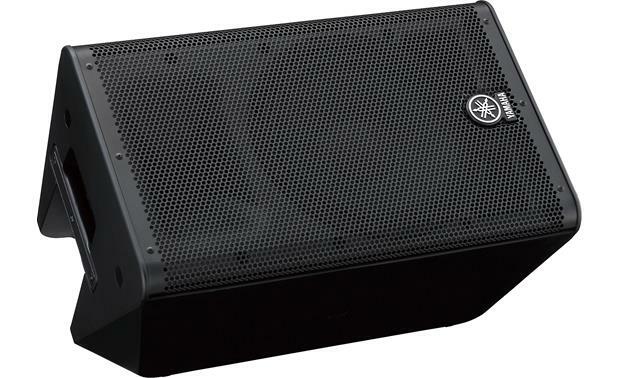 The package includes two Rapco/Horizon 25-foot cables, one for the mic and one that runs from the mixer to the speaker. The K&M Tripod Microphone Stand offers a sturdy tripod base and a boom extension so the mic user can move without colliding with the stand. 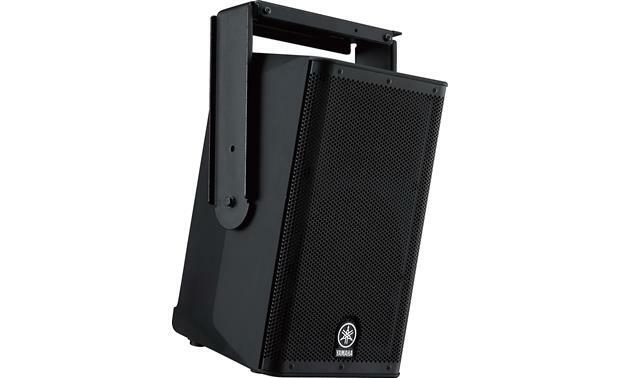 The K&M speaker stand adjusts from 52" to 79-1/2" tall to get your speaker up over a crowd. 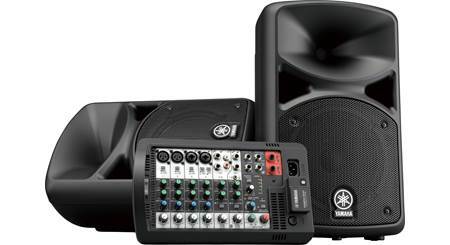 Find out more about putting together a PA system for smaller venues. 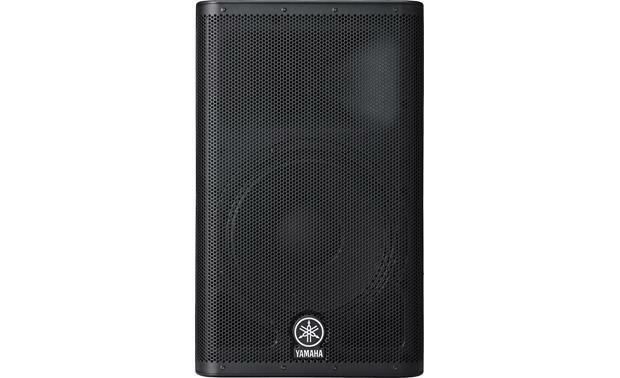 The Coffeehouse PA System bundle includes a Yamaha mixer and powered speaker along with a Shure dynamic microphone. 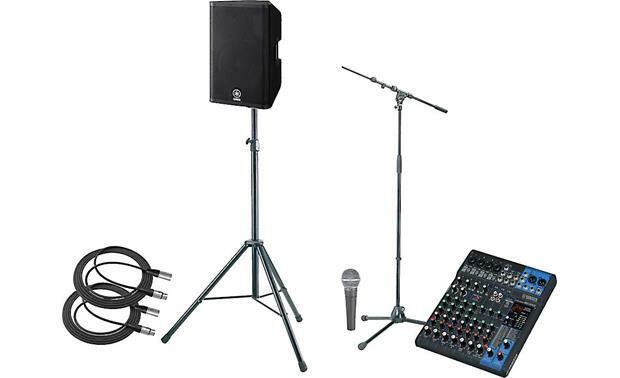 Also included are a K&M speaker stand and microphone stand plus two 25' Microphone cables (All individually packaged). 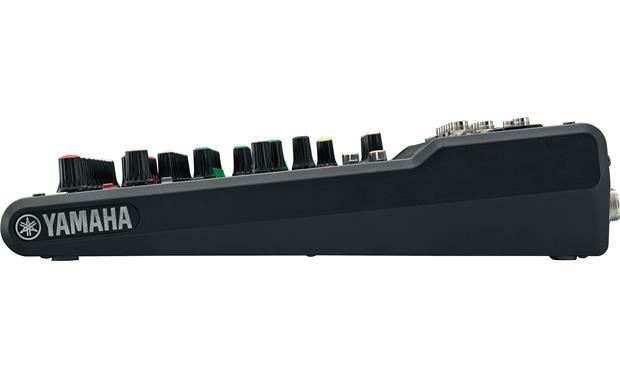 D-PRE (Discrete Class-A Mic Preamps): The MG10XU MG-Series mixing console features Yamaha's studio-grade discrete class-A D-PRE preamps, which utilize an inverted Darlington circuit comprising two cascading transistors in a configuration that provides more power with lower impedance. Delivering fat, natural sounding bass and smooth, soaring highs, with very low distortion, D-PRE preamps possess an impressively wide frequency range that allow them to handle signal from any audio source without overly amplifying any specific elements of the sound. Having such a pure sonic platform to build on will ultimately save you time and effort by eliminating the need for excessive EQ-ing or additional effects processing in order to "fix" your mix. 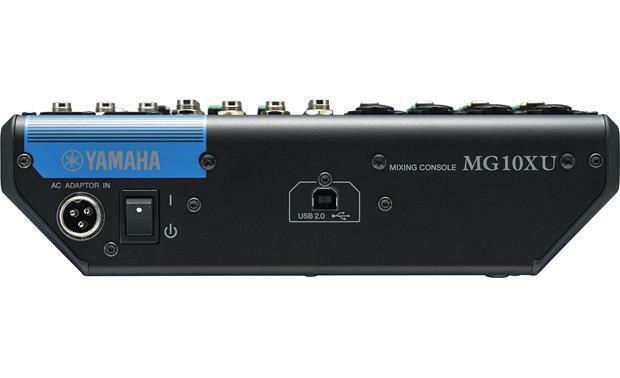 EQ & High-Pass Filters: The MG Series mixer benefits from Yamaha's unparalleled experience in designing pro audio gear, featuring 3-band equalizers (High 10kHz, Mid 2.5kHz, & Low 100 Hz) on all Mic/Line channels and 2-band equalizers (High 10kHz & Low 100 Hz) on all Line stereo/mono channels for precise control of your sound. 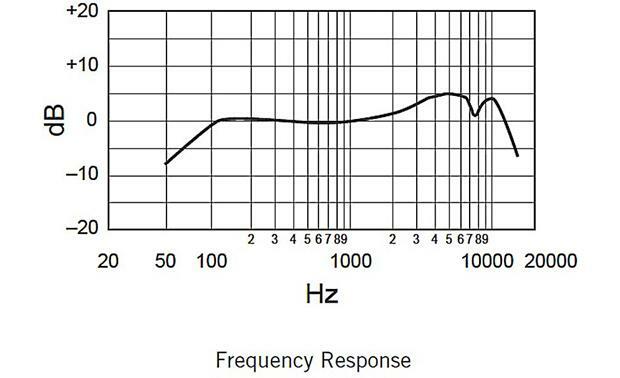 High-pass filters (80Hz) for the Mice/Line channels allow you to eliminate unwanted low-frequency noise, for a smoother, cleaner mix. 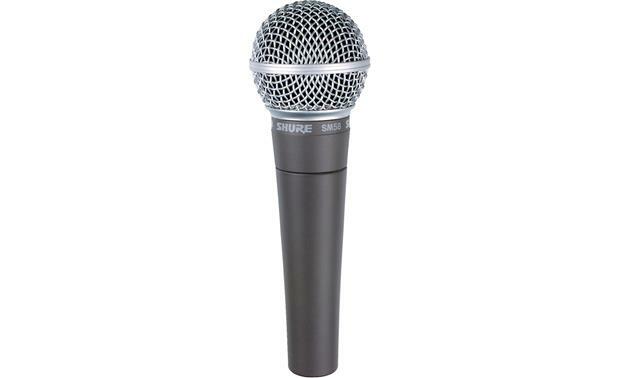 Overview: The Shure SM58 is a rugged professional microphone designed for live performance, sound reinforcement, and studio recording applications. 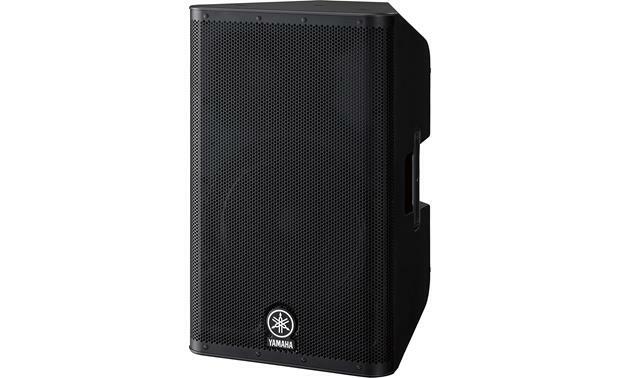 Its frequency response is tailored for vocals, with a brightened midrange, and a bass rolloff. 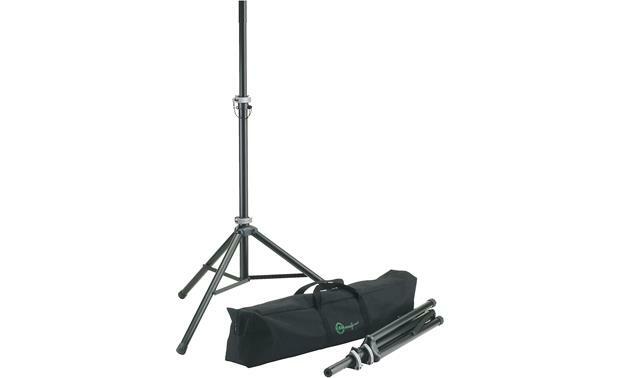 This SM58-LC model comes with a swiveling stand mount and a zippered carrying bag. 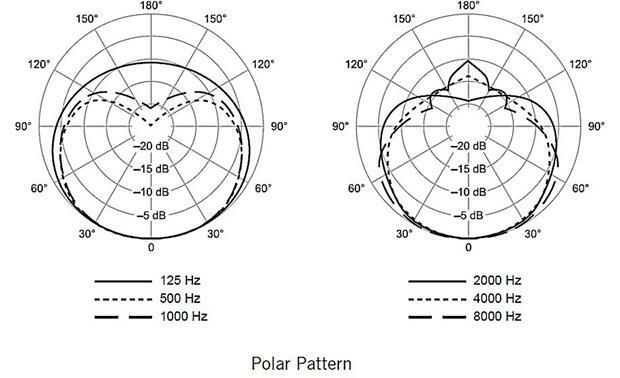 Pickup Pattern: The SM58 is has a cardioid polar pattern, which picks up the most sound from directly in front of the microphone, and some sound from the sides. This makes it less susceptible to feedback. Construction: The microphone has a durable metal construction, with a die cast metal handle and a dark gray matte finish. It has a pneumatic shock-mount system which reduces handling noise. The hardened steel mesh ball grille protects the internal elements, and resists wear and abuse. 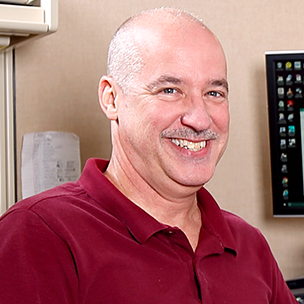 Inside the grille is an integrated "pop" filter that reduces explosive breath sounds and wind noise. Mounting: The SM58 comes with a swiveling stand mount, which provides a secure mount to a floor stand or a boom stand. The microphone slips into the swivel mount, which lets you tilt the microphone forward or backward over 180°. 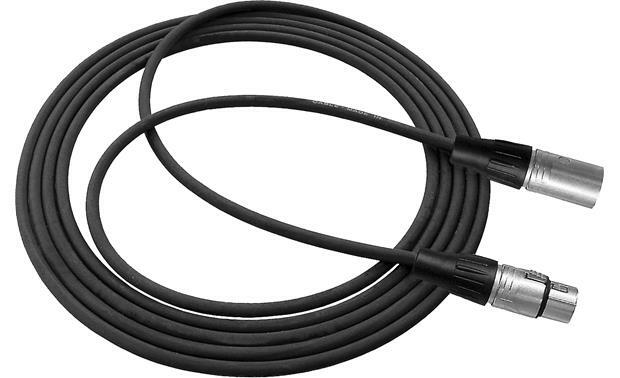 Connector: The Shure SM58 has a 3-pin male XLR connector. 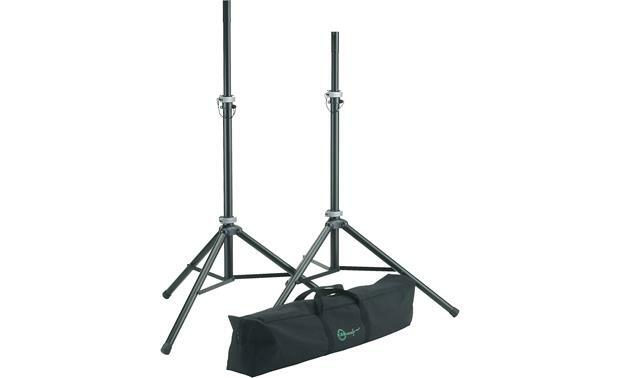 Microphone Floorstand w/ Boom: This microphone floorstand from K&M is designed for professional use and is extremely stable and durable. It features steel, zinc die-cast, and fiberglass-reinforced plastic construction with sturdy fittings and a high-quality black finish. It features a tripod-base with rubber feet to make sure it stays securely in place. The legs fold-up for easier storage and portability. A telescopic boom arm is included for added convenience and flexibility. Adjustable Height: 35.4" to 63.19"
Adjustable Boom: 18.11" to 30.32"
Speaker Stand: The König & Meyer (K&M) Speaker Stand (21435) is designed for mounting a single speaker equipped with a 35mm pole socket. The stand's base and shaft are made of sturdy steel tubing, giving it a load capacity of over 110 pounds (50 kg). The stand comes fully assembled, and can be used right out of the box. When not in use, the stand folds compactly for easy transport. Adjustable Height: The stand's height is adjustable from 56.7" to 87.8" (1440mm-2230mm). The laser-bored holes in the extension tube are spaced about 4.3" (110mm) apart for incremental height adjustments. The stand features a compact clamping mechanism with a patented push-button locking system which allows you to easily adjust the height of the speaker. The clamping screw provides stability, and can be tightened or loosened by hand. 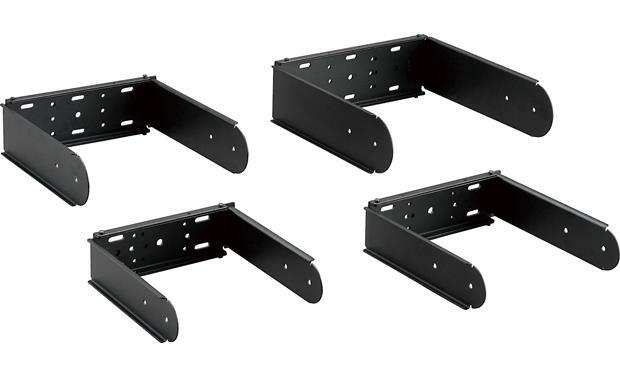 Base Construction: The tripod base features three 35mm diameter steel legs with cross braces and a clamping screw. When the legs are set, the maximum base diameter is just over 45". 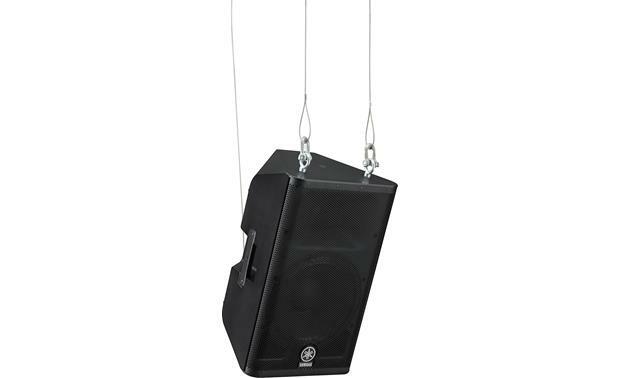 Safety Precautions: The 21435 Speaker Stand will safely hold large heavy speakers when placed on a sturdy, flat surface. The speakers must be mounted, and the stand extended, by technicians who have the physical capacity for the procedure. In most cases, there should be two persons to mount and dismount speakers and/or adjust the height. Microphone Cable: The RapcoHorizon Players N1M1-25 microphone cables use 24-gauge bare copper center conductors and a bare annealed copper serve shield for quiet operation. The outer jacket is made with a durable and flexible matte PVC compound. The cables are terminated with authentic Swiss Neutrik XLR connectors. The cables are 25-feet in length each. 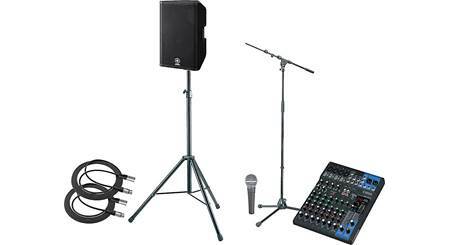 Searches related to the Coffeehouse PA System Bundle PA system for small venues: includes Yamaha MG10XU mixer and DXR12 speaker, Shure SM58 microphone, plus stands and cables.